Our Signs By Benchmark (a division of Benchmark Foam) team recently had some fun engaging in the holiday spirit while creating 7′ tall, 3D snowmen destined for outdoor placement. Each snowman features all the elements of the traditional Frosty, complete with top hat, scarf, carrot nose and “eyes made out of coal.” Well, cellular plastic carrots and coal, that is. 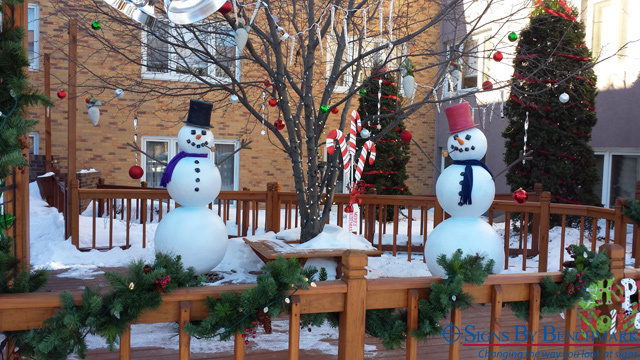 With the largest diameter being 36″, our snowmen stand tall and regal against extreme weather due to being sealed and cloaked in our signature polyurea hardcoat. 3D architectural accents are just part of our product line at Signs By Benchmark. Our team also specializes in custom exterior and interior signs, including sign components such as bases, pole covers and tops. Treat your customers to signage that includes a 3D architectural accent. It will be guaranteed one-of-a-kind. While many of our products are original designs, we also offer 32 standard models that may be created as is or customized to meet your customer’s unique needs. Give our Signs By Benchmark team a call at 800-658-3444 or 605-886-8084 to discuss your upcoming project ideas. Send your designs or ask for design assistance. Either way, our experienced team will work with you to create a product that will please your end customer.